31 1/2 (35, 38 1/2, 42, 46, 51)" bust circumference, buttoned. Cardigan shown measures 35", modeled with 1" of negative ease. Finished Size 31 1/2 (35, 38 1/2, 42, 46, 51)“ bust circumference, buttoned. 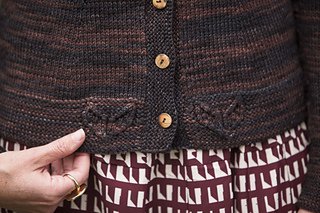 Cardigan shown measures 35”, modeled with 1” of negative ease. Yarn Prism Symphony (80% superwash merino wool, 10% cashmere, 10% nylon; 118 yd 108 m/2 oz 57 g): mink, 10 (11, 12, 13, 14, 16) skeins. Needles Bands and cuffs—size 5 (3.75 mm): 24” circular (cir) and set of double-pointed (dpn). 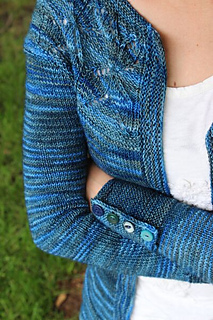 Body and sleeves—size 6 (4 mm): 32” cir and set of dpn. Adjust needle size if necessary to obtain the correct gauge. Notions Markers (m); cable needle (cn); stitch holders; tapestry needle; sixteen 5/8” buttons. Gauge 22 sts and 33 rows = 4” in St st on larger needle. 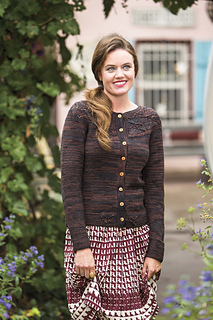 The fitted Cocoa Cardigan features a lace motif and garter-stitch accents to show off the beautiful color variations in tonal and handpainted yarns. 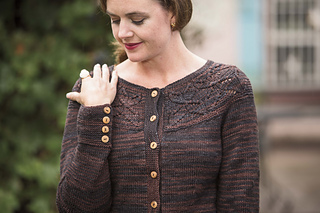 The round yoke shaping of the garter and lace transitions to raglan shaping to add emphasis to the yoke. 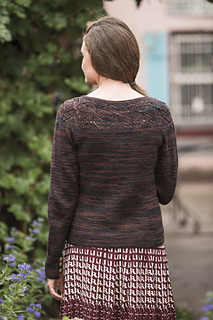 The version of this pattern available in my Ravelry store includes both charted and written instruction for the lace chart.